Here is a planetary display form I’ve made for mapping worlds in science fiction games. This map uses a “buckyball” geometry, a truncated icosahedron with hexagonal and pentagonal sections, but instead of filling it with hexes, it has been laid out with lines of latitude and longitude. The major latitude lines are in 10 degree steps, with further subdivision into 2.5 degree sub-steps, and the major longitude lines are in 18 degree steps (which neatly works with the pentagonal division of the ball). Longitude lines are shown at 4.5 degrees at the equator, extending to 50 degrees latitude, and then 9 degrees between 50 and 70 degrees latitude. These quadrants created with this mapping are not all equal, but it does provide a ready way to identify a location anywhere on the surface, and they provide a sufficiently fine-grained division of the planet to allow for distinctions of the different areas. Part of the inspiration for this was another wonderful “buckyball” planetary display done by Ronald Stepp which he posted on G+ recently. But in his map, each face is covered with a hex grid (which he warps to fit the pentagonal sections in a most interesting way). One of the comments asked about a way to identify the small hexes for mapping and note making purposes, and that got me thinking about latitude and longitude. This is being made available as a pay what you want PDF through RPG Now and DriveThru RPG. Once it’s approved, this should be [Update: it’s available now!] the link to get the Planetary Display PDF. It’s pretty apparent to me that this could be cut out and turned into a 3D object quite easily. But what seems easy to me isn’t necessarily easy for everyone, so if I need to put together a tutorial for that, that’s something else that could be done. There will be revisions to this, and if you have suggestions, we’ll be glad to look at them and see about incorporating them into an update. There could also be a spin off variant that is more oriented for fantasy rather than SF games. We’re also probably going to have a very large version (maybe 24″ x 36″ or so) that we’ll have to sell direct, rather than being able to distribute through DriveThru. There will be an announcement about that when that is further underway. There is now a very basic outline version of the DragonQuest combat rules posted at DQRules. I’m providing extra notice here for those of you who are following Antherwyck House for DQ-related stuff since there are more followers here than there are on DQRules itself. There are PDF and .DOC versions, as well as a pretty bare plain text, so hopefully at least one of those will provide a useful version. This is just the bare bones of the DQ combat rules, but is probably enough to run combats if you already have some familiarity with the game. More importantly, it is the basic skeleton on which the system is built, so a retro-clone would start with this framework and expand out to flesh things out once more. The other series of questions to be considered are regarding whether any of these core rules should be modified or revised as part of the new version of DQ. A total retro-clone would stick to this with very little deviation, but a new edition of DQ should consider improvements and modifications. Before things get too in-depth, this needs to be the next set of considerations. There are some ideas already being kicked around, but additional feedback would be especially useful for this project. There are two primary lines in this intersection, but unlike some of the others, this doesn’t have multiple connections between different paths. To get from one side to the other, you have to go through the two locked rooms on this one. There are a few side rooms, and one complex of rooms off the passages, rather than being connected to other parts. These maps I’ve been making with very little post-processing. Generally, these are just pencilled and then inked and then scanned and posted, so some of the warts and flaws show from time to time. But, overall, they seem to be working well. I’m still very interested in hearing about anyone using any of these in actual play. What Should the DragonQuest Retro-Clone Be Called? I’ve opened up the idea of assembling a retro-clone of DragonQuest, but one question to be answered is: What should it be called? For a long time, I was interested in using the original name for DQ: DragonSlayer (before a now long-forgotten movie of the same name came along, and SPI shifted the name of their FRPG in order to use that title for an equally long-forgotten tie-in game). DragonSlayer would be a good name with a historical connection to the game, but things have become more complicated. In the same realm of retro-clones and throwback games and the like, there is now a title called “Crimson Dragon Slayer” by Venger Satanis. And given the potential for confusion between the two names (as well as the fact that he also publishes through OneBookShelf, as does Antherwyck House Games), that option is now much more problematic. Also, even among the grognards and the long-time fans of DragonQuest, not a lot of them know the early alternate name, and no one looking for things related to DragonQuest is likely to be looking for things under another name, so it would have very little benefit to have a different name in order for people looking for DQ-related materials to find it. There is also the Nintendo videogame series called “DragonQuest” that is often a point of confusion. A new name might help distinguish between the RPG and the videogame, particularly since the latter is still actively being produced and promoted. There is also the project organized through the Yahoo Groups called DragonQuest Open Source or Open DQ. But OpenDQ is also a name for a data quality software project. Retro-clones of other games need to avoid using the name of the original source, because those companies are still in business, and their trademarks for the original title are still active. That is not the case with DQ. So a name with “DQ” or “DragonQuest” in the title shouldn’t be challenged on that front. The videogame might be more of a point of conflict. So, it seems to be open season for a new name for the game. This seems completely open for new ideas and discussion, so I hope you will add your suggestions to the mix. Intersection H is closer to the idea in some of the early Intersection series. 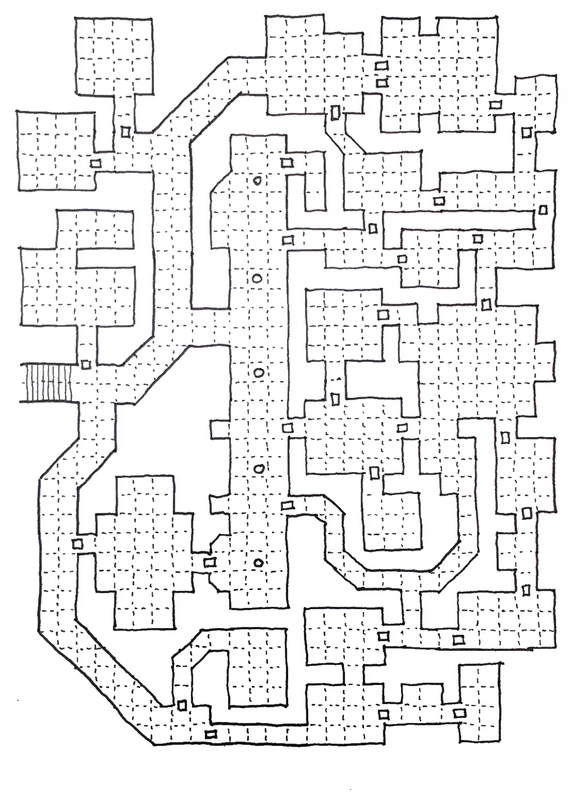 There are a couple of clearly long-running hallways that come close to one another, and this knot of chambers and halls is the way of connecting from one to the other. Of course, there are a couple other passages that connect into this intersection, as well, and a couple rooms that are peripheral to the rest of the ensemble. The hall of columns is not a neat and orderly space; the columns are irregularly spaced and asymmetrical in the room, and their appearance is more like menhirs than Greek columns. There are also two large pairs of stone plinths, each much larger than the columns. One is in the hall of columns and the other in the antechamber to that hall. All of these are decorated with extensive pictographs/hieroglyphs which wind around each of the plinths. Start with a simple map layout. One vertical corridor and two crossing horizontal halls. Put a few rooms into the spaces between the passageways. Then greeble the hell out of it. This portion of the Rahnlaine Dungeon was constructed during the Bistich Hegemony, when crenelated construction was in favor over long unbroken walls (since it was much harder to write out opposing Dravellar slogans on irregular surfaces). Though of no practical benefit in underground warrens, the style was adopted even for the extensive works beneath Castle Marthrikt and the keep of the city. This space is ideal for encounters with small creatures that can readily hide in the shadows and the many niches and corners. 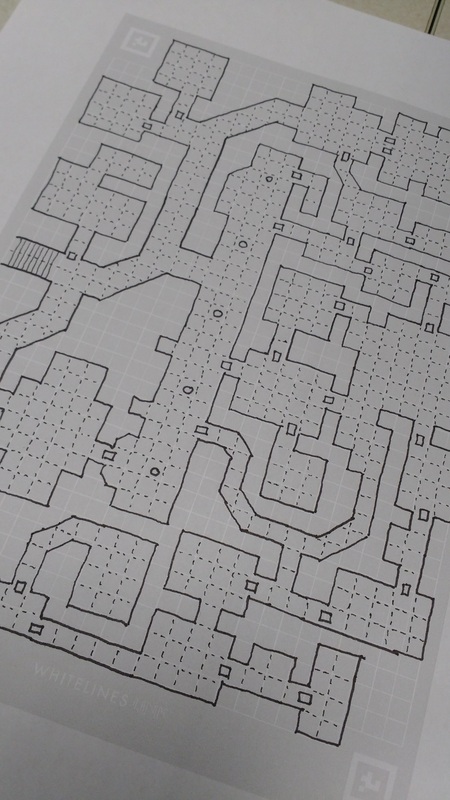 These halls extend many hundreds of feet in all directions, with many connections to the basements of buildings and to the fortifications around Castle Marthrikt and the city. As is the case with most of my maps, feel free to use this for any non-commercial purpose (with attribution). You can also contact me if you’d like to use any of my works for a commercial project.